The Milwaukee MW600 is a Dissolved Oxygen meter ideal for use in school laboratories. Dissolved Oxygen measurements are also very important in fish farms and ponds, where Oxygen levels are continuously monitored to obtain optimal reproduction. The Milwaukee SM models have been advanced to the Innovative "MW" models! Milwaukee Instruments applied science section has totally reformulated and redesigned the "SM" portable economy meter group. The Milwaukee MW600 calibrates easily in 2 points (at 100% saturated air and in 0 Oxygen solution) and has Automatic Temperature Compensation which guarantees the highest accuracy. The low battery warning, easy to replace screw on cap membranes make this meter very simple to operate. Rugged Carrying Case (Optional) provides handy on-site meter calibration and measurements. 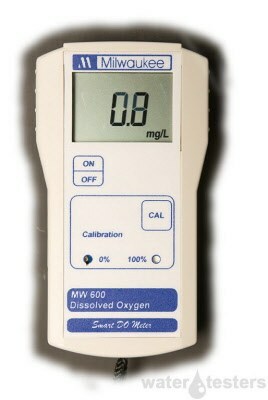 In my opinion for testing water this is the Dissolved Oxygen Meter to have as it is very easy to use. Great for measuring yout fish tank and aquarium water parameters.